With each month illustrated with a colorful motif, this counted cross stitch design would make a great addition to a child's room. Kit contains cotton thread, 14 count Aida, thread sorter, needle, and easy instructions. Finished Size: 10" x 14" (25 x 36 cm).. Finish as a pillow or a frame. Kit contains: cotton thread, 14 count beige cotton Aida, needle and instructions. Fabric 12 in x 12 in. Complete alphabet included. Pillow finishing materials are not included..
Find your spot for a Zen moment with this Asian inspired counted cross stitch design. Contemplate Chinese philosophy and spirituality as you stitch this serene scene. The characters translate to the positives in life, such as bliss, harmony, leisure, peace, and happiness. The softly shaded background is printed on the 14 count ivory Aida. Kit contains cotton thread, printed 14 count ivory Aida, th..
Pillow finishing materials are not included Size: 12'' x 12''..
Yum! This sweet treat will add a colorful touch to your kitchen décor. Everyday Cupcakes by Dimensions in stamped cross stitch features a printed recipe background and is quick and easy to stitch. Finished size: 6 x 6 (15 x 15 cm). Designed by Catherine Holman. © Catherine Holman / Next Day Art. This stamped cross stitch kit contains: • Presorted cotton thread • Printed white fabric • Needle • Ea.. Pretty posies poke their little heads out of a pair of boots in this delightful counted cross stitch design. Cheerful and inspiring, Grow by Dimensions is sure to brighten any room! Finished size: 5 x 7. Designed by Andrea Tachiera. © Cerrito Creek. 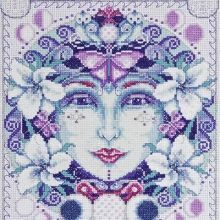 This counted cross stitch kit contains: • Presorted thread • 14 count white Aida • Needle • Easy instructions..